Watches and jewellery have long been at the centre of fashion, making a dress or a suit look more elegant and stylish according to the style and shapes of the pieces selected. People have dreamed about the haute horlogerie and jewellery of such icons as Princess Diana or Marilyn Monroe, a dream strengthened by films and lyrics that emphasize that diamonds are a girl’s best friend. Today’s haute horlogerie and jewellery have reached beyond traditional materials like platinum, different golds and precious stones. Brands such as Ladoire, AudemarsPiguet and Richard Mille are innovative with new colours, materials and textures, making their luxurious items ideal for my OC Concept Stores in New York, Saint Tropez and Courchevel. 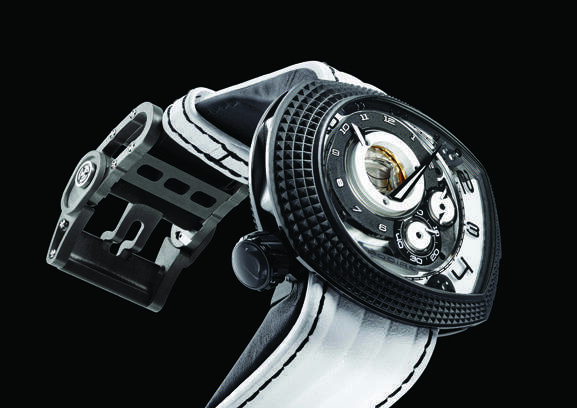 My latest discovery is the Roller Guardian Time Punk White Ladoire timepiece, created by Lionel Ladoire. Crafted in titanium, the limited edition, haute couture watch refers to Punk Rock codes. Directly inspired by cutting-edge technology, three rotating disks mounted on high-tech ceramic micro ball bearings reveal a stunning timepiece to suit the most inventive wearer. The slightest details are delicately crafted: the watchstrap is made of full-grain hand-stitched calf leather with sewn stripes and an articulated titanium buckle. Truly avant-garde.Ladoire is a jeweller, rock drummer and professional snowboarder, born into a family of four generations of jewellers. Based in Geneva, Switzerland, Ladoire develops sophisticated exclusive timepieces in unique, three-piece or twelve-piece limited editions. Like me, Ladoire seeks to offer the best to those who dream of luxury and exclusivity. October is Breast Cancer Awareness month and, as a woman, I had to be part of this incredible initiative one way or another. Don’t get me wrong, to me black remains the ultimate chic when it comes to fashion. But October is different. October is Breast Cancer Awareness month and, as a woman, I had to be part of this incredible initiative one way or another. Six months ago, Mr.Fuscien-Trasan, CEO and designer of Paris-based high-end training accessories company KiS-KEEP IN SHAPE, suggested I support breast cancer research and prevention by creating a special PINK edition of his KiS collection for the OC Concept Store. The fit was perfect and the exquisite KiS pink collection is now available only at OC Concept Store. The sales of the pink collection will benefit The Breast Cancer Research Foundation dedicated to one of the greatest causes of our generation. During the whole month of October, OC Concept Store will donate 10 percent of the sale of all pink jewelry, watches and accessories to support The Breast Cancer Research Foundation. This includes my pink limited edition Richard Mille-OC watch, the Orianne Collins Jewellery Romance rose gold and pink quartz ring, the unique pink bear sculpture by the Spanish artist dEmo and “Walking the dog” by famous fashion photographer Robert Farber. Then, on October 19 from 6-8 p.m., OC Concept Store will auction the luxurious KiS pink-leathered dumbbells, rope and gym mat generously offered by Mr Fuscien-Trasan. I truly hope that the profit from the silent auction combined with OC Concept Store donating 10 percent of any purchase in the store that night will help research and prevention, two areas key to the fight against Breast Cancer.